Le Burgundy is one of those quintessential Parisian hotels that Hollywood would just love to bottle up and sell to the world. 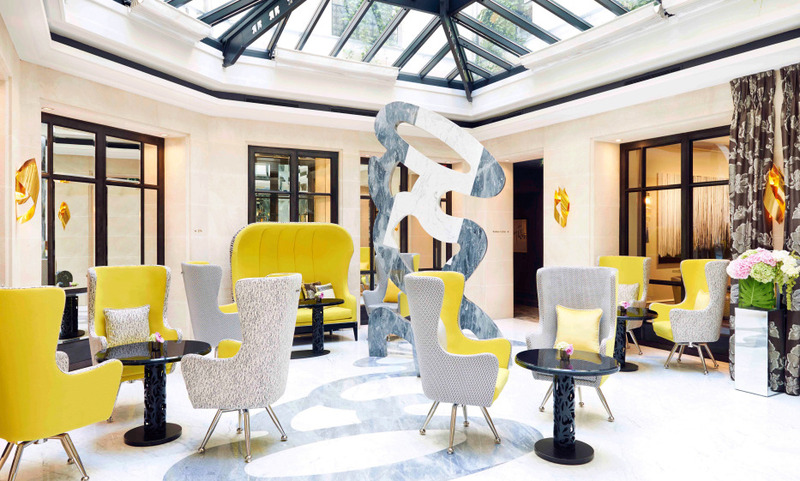 Original art adorns every section of this hotel and its location close to the designer stores of Rue Saint Honoré and the Tuileries Garden make it THE perfect base camp from which to indulge in the oh so Parisian activity of the “flâneur”. An intimate hotel of only 59 rooms and suites, Le Burgundy’s diminutive stature belies a hotel whose French “savoir- faire” and style easily rivals the city’s sprawling palaces and Grand Dames. People don’t come here to “see and be seen” but to instead live like a Parisian ought to. Fittingly, the wine list at the hotel’s restaurant (and the modern French fare) is second to none. The spa is one of the city’s best, and all of the rooms would look right at home on the cover of a design magazine. Numerous contempory artworks in the hotel. A Michelin Star restaurant, Le Baudelaire, serving contemporary French cuisine. Le Spa Burgundy in partnership with Sothys with its beautiful indoor Swimming pool. A very pleasant stay in a very well located hotel. Staying here is always a pleasure. We have stayed at Le Burgundy in the past and we were again very happy with our recent stay at Le Burgundy and would definitely stay there again. They were very accommodating and we received an upgrade to a larger room, the Tuilleries Suite, to accommodate myself, my husband and our Granddaughter. The concierge staff was very helpful as well as the entire staff. I enjoyed staying in this Hotel, I liked everything and the staff was very friendly. Next time I would also stay in the same Hotel. A very well located hotel in Paris. Not too big and with very friendly staff. very nice hotel with a very good service and a nice decor. I think we were treated fabulously &amp; I would be delighted to return. I do suggest that they oil the toilet room door in our room. Plus, we found that door to be very heavy....but that was so minor compared to our wonderfully positive feelings about being treated like royalty at this hotel! Great chic Hotel, best area and nice and friendly service ; we will come back an recommend further! Very well located and with discreet service that is efficient and detail oriented. The atmosphere was great. I Loved the hotel and its staff. The rates are not abusive and the location is great. Very good except for two things : the wifi doesn’t work in the room and the service at the bar takes time. Perfect location. Staff very kind and efficient. Definitely I will recommend to all our friends and will come back as soon as possible. A nice boutique hotel in the centre of Paris! The Only thing which was not ok for us was that the bar, the restaurant and the Spa were closed due to renovation works in the kitchen., which also caused noise during day time. Burgundy is a very nice hotel! We had a great time. Everybody was so friendly, everything was clean, nothing to complain... Only, the temperature of the water from the swimming pool was too low. It was not nice to stay in, so we left after 5 min. Lovely hotel with great amenities, service and location. Would definitely come back. Really nice hotel. Staff is very efficient and cheerful. Hotel Location very nice. Cons: The toilet in the bathroom. Luckily we were upgraded. I guess that the room we booked was smaller. Its price, therefore, was too high. Fantastic hotel - would not hesitate to return here - it is ideally situated - very near to the place de la Concorde. Staff were all very helpful and efficient - room was lovely and the bed was the most comfortable bed I have ever slept in! Perfect location, very quiet and kind hotel, we come back! Good staff! A vey classy and luxurious hotel. Not large, but then it gives an intimate feel. Rooms are wonderfully decorated. Very well located in the heart of all of Paris's attractions and easy access to the Metro. A top-class hotel with an amazing cozy spirit. We will certainly book again for a longer stay very soon in this hotel. We truly loved this hotel. Great location, superb staff and beautiful room ! I love Le Burgundy, its pool and spa and the very friendly staff!